The Syrian war and general unrest in the Middle East, and the related wave of refugees, has spawned debate here in Canada about how much help we can or should provide. Canada seems like a natural participant, given our rich history of welcoming huge waves of refugees from past conflicts. Yet some arguments I have seen on social media against providing that help strike me as deeply un-Canadian in their lack of compassion. I certainly hope I can debunk some of those ideas, so we can put them behind us and step up the way we can and should. One line often spouted in recent weeks is that we should look after our own first, and if we can’t care for veterans or homeless here, then obviously we can’t accommodate refugees. Yet this is a false choice. As shown many times in the past, when we accepted tens of thousands of Ugandan or Vietnamese refugees in the early and late 70s, tough economic times is no barrier to helping those in dire need. We are, per capita, one of the richest nations on earth and in all of human history; if we can’t afford to provide help now, what was the point of years, decades, and centuries of economic growth at the expense of our planet? But if (or when) we fail our veterans or homeless, it’s not truly for lack of wealth, but lack of priorities. When compassion guides our hand, we find we can actually help our own as well as many from foreign lands. Another silly argument is that this should all fall on Islamic nations to solve. This starts by ignoring that the majority of the Syrian refugees are so far being accommodated in Syria’s Islamic neighbours Turkey, Lebanon, and Jordan. But even if there are some rich Arab nations perhaps not doing their share, since when has the poor behaviour of other nations been an excuse for us not to act? Some state, facetiously, that there are tens of millions of refugees and we can’t absorb them all. Of course we can’t; no-one has suggested we should. Rather, we are asked to be part of an international solution that settles some refugees in each host nation, while trying to get many of them back home, once peace permits. But the strangest argument is that we should only take in Christian, not Muslim, refugees to protect our “traditional culture”. Have these people not actually read their Bibles? Perhaps Christ’s most famous parable is of the Good Samaritan, told to demonstrate that God commands Christians to love and help other people, even those of a different, despised faith. The idea that Christians should only, or preferentially, aid other Christians contradicts basic compassion as Christ himself defined it. Published as my Root Issues column in the Barrie Examiner as "There are many ways to help Syrian refugees"
Most of us realize our society has to make some serious adjustments to avoid chewing up what’s left of our planetary biosystem for the sake of convenience and a better lifestyle at a lower price. We can’t make it an all-or-nothing battle, because then too many will feel that total change is too hard and instead choose nothing. Instead, each of us, whether an individual, family, government or company, needs to start moving in the right direction of lowering our ecological impact. But where to start, and how do we afford these changes? One simple choice for consumers is to seek out organic and free trade food products, like coffee. Years ago I switched to fair trade organic coffee, and so far it hasn’t been too hard to find. Even if I can only find one on the shelf that is certified organic or fair trade, but not both, I generally figure that’s good enough, because both approaches have enough significant overlap that if you achieve one, you pretty much do the other. Trust the three-legged tree frog. But occasionally when shopping, the store is short of our usual brands. On one such occasion, I found a major brand product sporting a frog-shaped seal declaring that 30% of their product was Rainforest Alliance certified. I decided to give it a try, and to look up the certification to see if it was real or just a greenwash. It turned out to be a real, independent organization, not something Nabob had cooked up to put on their own label. It’s an NGO with a number of programs aimed at protection and conservation of rainforests, including certification of tourism and forest-grown foods that meet standards of environmental, social, and economic sustainability. Although some criticize Rainforest Alliance, since they don’t insist on 100% organic and don’t set a minimum price the way Fair Trade certifications do, or because they’ll allow their seal on a product that only contains 30% certified content, I believe there is a genuine role for this kind of program, particularly in helping large organizations gradually shift the market. You see, although some call for places like Tim Horton’s or McDonalds to serve Fair Trade coffee, the problem is there simply isn’t enough supply in the world for them to do so. If they made such a commitment, they’d find that the world had run out of Fair Trade coffee just a few weeks into the year. What’s more, they would be buying up all the global fair trade supply to the effect that there would be none left on shelves for those of us who prefer to make our own cup of java. A direct jump from business-as-usual to fully sustainable simply isn’t possible. However, a company like Tim's or the Arches can make a commitment to source a certain percentage of their supply from fair trade (or organic) sources, and then commit to increasing that amount over time, as supply increases in response to their demand. Any improvement beats doing nothing. And in fact that is what has happened with Nabob’s Rainforest Alliance certified coffee, which now features 60% certified content, instead of the original 30%. As they near 100%, I hope it puts pressure on other brands to start including, and increasing, their own sustainable supply. Your choices at the grocery store can help this process. Published as my Root Issues column in the Barrie Examiner as "Grocery store choices can help rainforest"
Last week I became a moving speed bump. Perhaps some had already marked me in that category, but now it’s official. 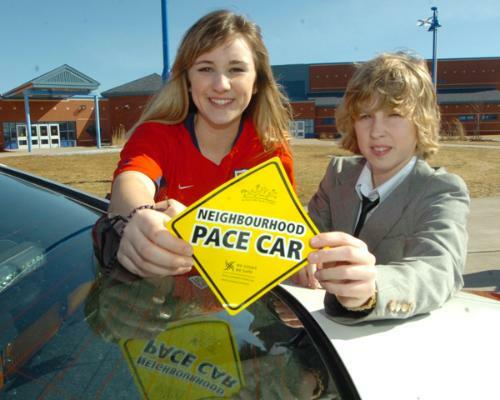 Actually, I signed on as a “Neighbourhood Pace Car Driver.” This means I have a caution sign in the back window of my car, and have pledged to keep to the speed limit on all municipal roads. So if you’re behind me and want to speed, you’ll have to change lanes, or follow me at the limit until we part ways. The street receives the same traffic-calming benefit as a speed hump, without the unnecessary braking or wear on your suspension, and without cost to the taxpayer. This program is sponsored by Parachute Canada, a national charity formed in 2012 through the amalgamation of four existing programs, each of which dealt with some aspect of injury prevention: Safe Communities Canada, Safe Kids Canada, ThinkFirst Canada and SMARTRISK. Realizing the similarity and overlap of their goals, they combined their experience and expertise as Parachute so they can achieve greater impact in awareness, advocacy, and action in the vital cause of injury prevention. Pace Cars are a program that combines all three elements by raising public awareness, advocating for safer road use, and acting directly to slow down speeders. I recognize that my driving impacts the livability of other residents’ streets, just as theirs impacts mine. As a neighbourhood pace car driver, I agree to drive the posted speed limit, stop to let pedestrians cross, and generally be courteous to other road users, like cyclists. I also minimize my own car use by combining trips, using transit or car pooling, and walking or cycling (active transportation) whenever possible. My Pace Car sticker on the back of the car lets other drivers know why I am not exceeding the posted limit, and hopefully helps them understand why I am setting a more leisurely pace on the streets where we and our families live, work, and play. More generally, it indicates that I care for others by keeping courtesy and safety in mind as I drive. In some ways it’s akin to neighbourhood watch or block parent programs, as I take part directly in helping improve the safety of those around me. I assumed it would be simple, as I have never been a leadfoot on city streets. (We won’t speak of expressways here). Nevertheless, now more speed-conscious, I notice many roads where my natural or “comfortable” speed is 5-10 km above the posted limit, so I must actively ensure I dial it back a bit. Luckily, the cruise control function largely takes care of this for me. One side benefit is that, through slower and more aware driving, I get even further on each battery charge (or litre of gas) in my Volt, so I’m also helping reduce energy demand, smog, and greenhouse gas emissions. If you like the sound of this, and are interested in becoming a Neighbourhood Pace Car driver yourself, contact local community coordinator Sherrie Osmond (slosmond@sympatico.ca ) to sign up in Barrie, or if you want to start up or connect with the program in another community, contact Julie Taylor (jtaylor@ParachuteCanada.org) at the national office. It’s time to rally around the safety of our families and our neighbourhoods as we walk, wheel, cycle or drive! Published as my Root Issues column in the Barrie Examiner as "Keeping pace can keep us all safer on the roads"